Last Saturday, I welcomed home a new member of the family. Part of it looks like this. Here’s a clue. 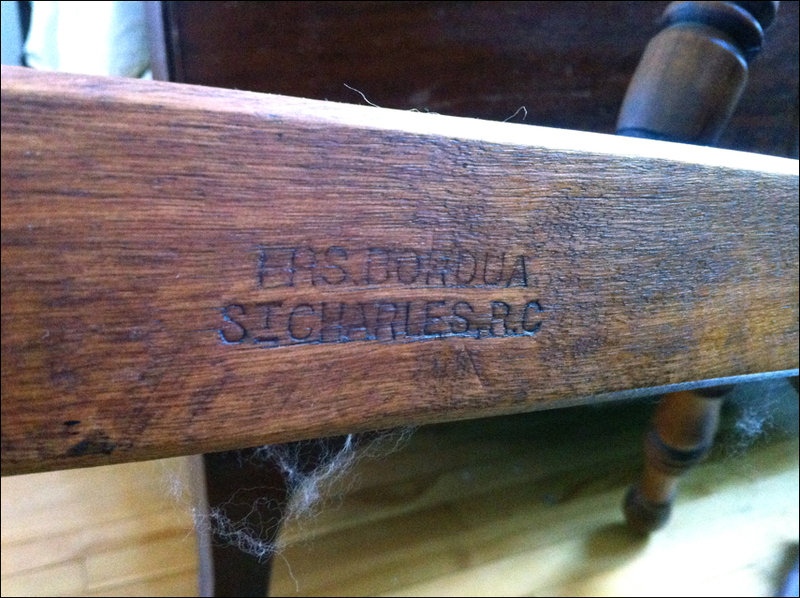 A small piece of wool, probably quite old, stuck to the wood under the mark “FRS. BORDUA, ST CHARLES, R.C”. If you’re still stuck, how about this? 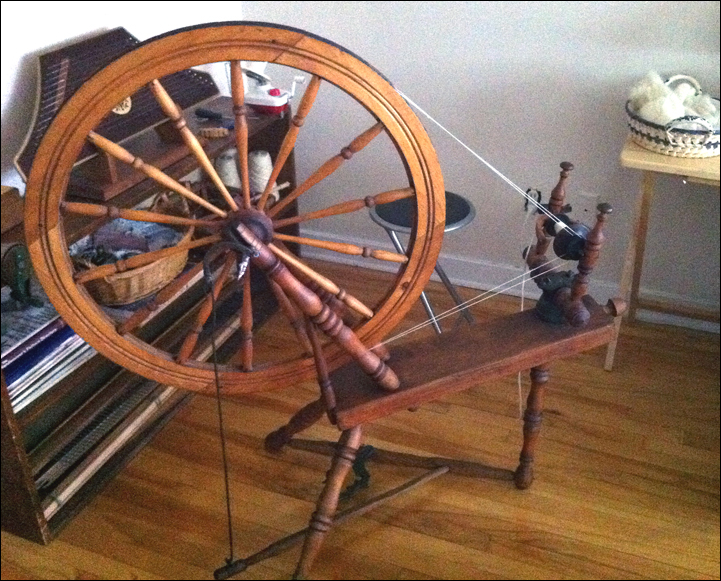 Yep: it’s a new-to-me-but-actually-quite-antique spinning wheel. Last week I was listening to a podcast that mentioned Canadian tilt-tension production wheels. I’m lucky enough to live in the general area where these wheels were manufactured, so on a whim, I stopped by ye olde Craigslist. The next thing I knew…. 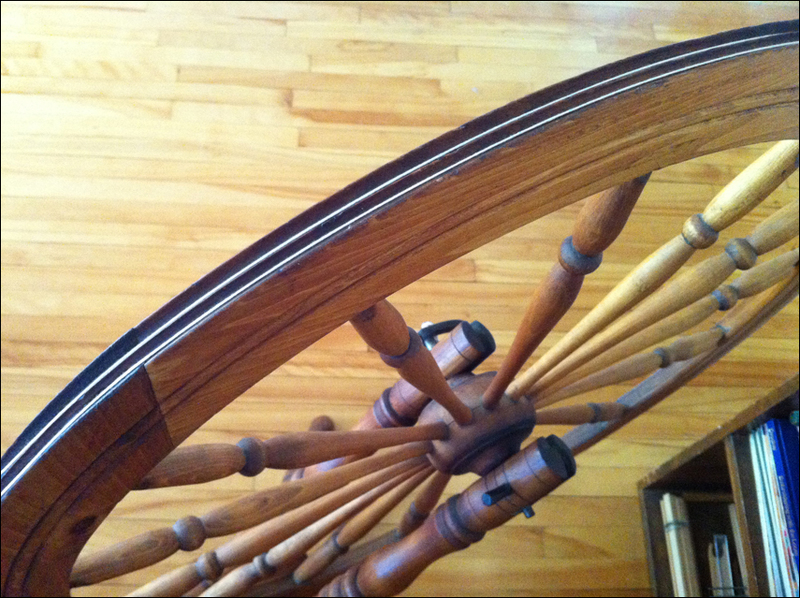 My spindles were a little nervous, but I’ve promised them that they won’t be neglected. It’s a perfect fit for my needs, not to mention my tastes. 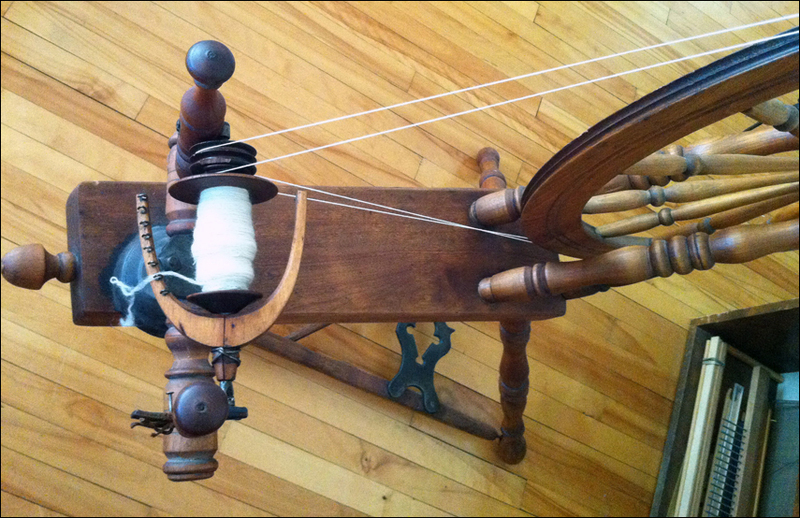 I’ve been saving up for a Saxony-style wheel with a single treadle, and I knew that I wanted to make primarily fine yarns for weaving, and I like antiques, and this puppy fits the bill on all counts. It’s a François Bordua wheel from St. Charles, which according to this site dates it to somewhere between 1843 and 1903. 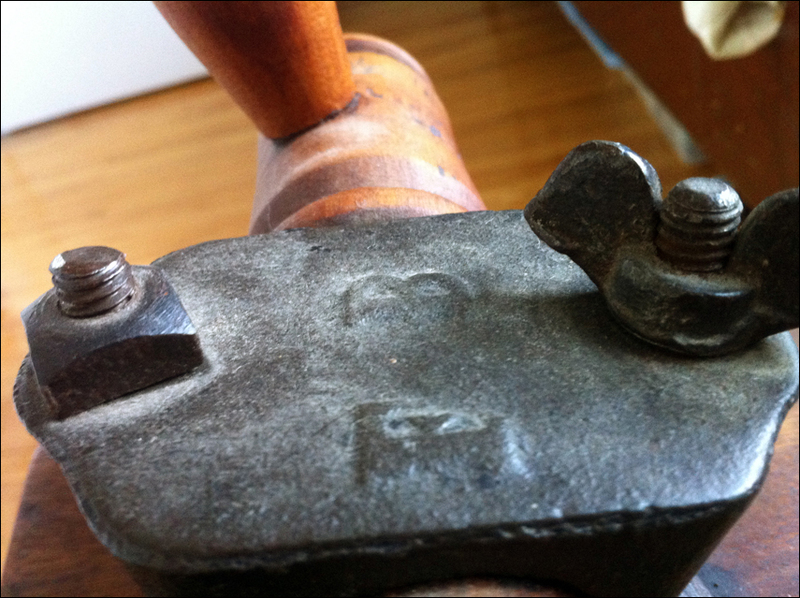 So it is an antique, and there are a few issues. The flyer was repaired sometime in the distant past, and it’s still a little wibbly. I’m telling myself that this has nothing to do with the fact that I DROPPED IT the first time I sat down to spin. (Yes, really. I almost cried. *) The arms of the flyer are wired together with what looks to be fairly heavy-gauge steel, so it’s not going to fall apart, it’s just… wibbly. Naturally, I’m a little concerned about doing further damage, so before I settle in to any serious spinning I’d like to research repairs, replacements, and what I should and shouldn’t do. That isn’t to say I didn’t try it out. And it was delightful! (For what my opinion is worth, anyway, since I’d never tried wheel spinning before.) It was also very fast. I love this thing. As with most wheels of this kind, there’s only one bobbin, but that’s fine. No different than spindle spinning. 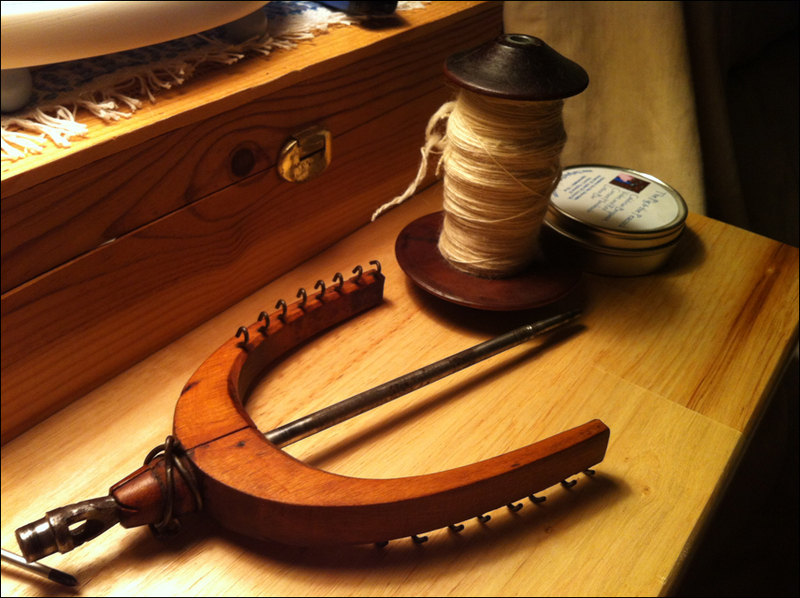 Fortunately, my loom came with a swift and a ball winder, so I am well equipped. Have any of you ever worked with an antique wheel? The owners of this one for the last twenty years used it as a decoration, so I don’t know how long it’s been since it was used. I think it’s time to put it back to work. Carefully! *Actually, what happened was that the front leather bearing was too loose, so the flyer slipped out and skidded across the floor once the wheel started spinning. I think the skidding motion is what saved it: if it had dropped straight onto the floor, I suspect that it would have broken into pieces and that I would have been a sad blogger. Hopefully we will never find out. Looks beautiful! What a great find! Thank you! It’s very exciting. Good luck with your own wheel search! Just so long as you don’t crash into the wheel! Hi, I just found your blog and also, today just happened to buy a wheel very similar to yours (same pedal and double drive?). Anyway, I cannot for the life of me figure out how to get the yarn to wind onto the bobbin….I’ve never owned a spinning wheel before and have only, once, used a walking wheel. Also, like yours, my flywheel is held together with a thick wire. How do you/we get the yarn onto the bobbin? Check to make sure your driveband is looped around both the bobbin and the flyer whorl: maybe a silly notion, but it’s easy for it to slip out of place on these wheels. I’ve noticed that when the yarn doesn’t wind on, sometimes I’ve got the band wrapped twice around the bobbin whorl and not at all around the flyer. 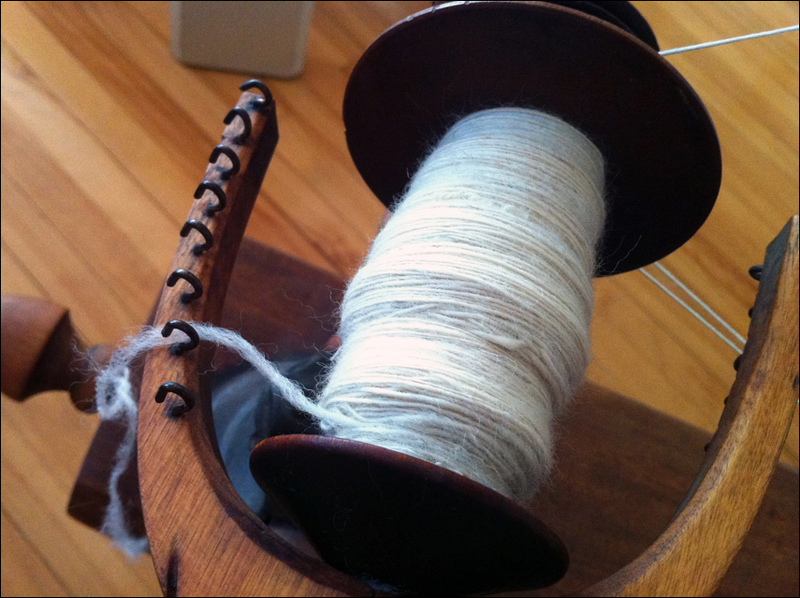 The other trick, when you first start to treadle, is to help out your wheel by slowly wrapping the leader around the bobbin by hand in the same direction that you’re spinning. A couple of wraps is usually enough for it to catch, and then you’re up and running! Good luck with the wheel! I’d be curious to hear how it works for you. I’ve grown really fond of mine.